I think this will get expanded into a more general "3d object loader" that supports lots of formats (.x, .max, .md2, etc). I'm still too inexperienced with the pros and cons of these formats to know what's appropriate to group together, and what isn't though. The binary format is undocumented. A few minutes of googling didn't turn up any viable reverse-engineering results. It's procedural --- so generating a mesh from a .max file would require implementing the base types and whichever procedural modifiers were used. ...and if we're going to go the procedural modeler route, I think it might be preferable to go with a more open standard, such as RenderMan (aqsis, pixie), or gSculpt or something. or CSG. .3ds and .obj files are way easy in comparison. it would be really good to consolidate all the various 3d stuff into one place on this site, rather than in several places. Agreed, some more inspection of .max makes it non-viable. i grafted the "3D stuff" forum post and franz's response into this Feature Request, and named the Feature Request more generically "3D Object Loader". Yeah --- renderman is overkill for just geometry and textures, and I think a good solution for that would be a good .3ds / .obj loader. But as a separate project, procedural modeling and/or CSG would indeed be quite rad. i understand all the difficulties of implementing .MAX file format. However, when working with polygonized 3D (as opposed to NURBS), one will make extensive use of quads, or N-gons. When exporting to .3DS file format, the model gets chunked into triangles (or at least, triangles gets visible) which is really annoying, as the model looks tesselated. 3ds and Obj are easy because they are 15 y-old file formats.... Forget about Renderman file format, it is used for multi platform rendering, but not really suited for realtime graphics. This could be interesting. it'll be yet one more library to integrate into kineme 3d, but it looks like it won't be too much of a problem. On that note, can you provide some sample objects so I can start experimenting with this format? 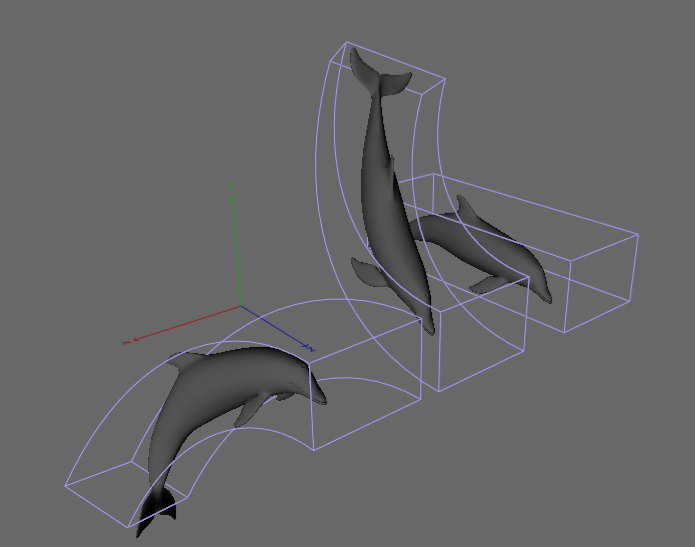 In related news, the FBX format (supported by kineme 3d), there's support for NURBS objects as well. currently I don't handle them, but the code to do it should be simple. I just don't have any sample objects to test with first. Some models in fbx nurbs format would be handy too, for similar reasons. 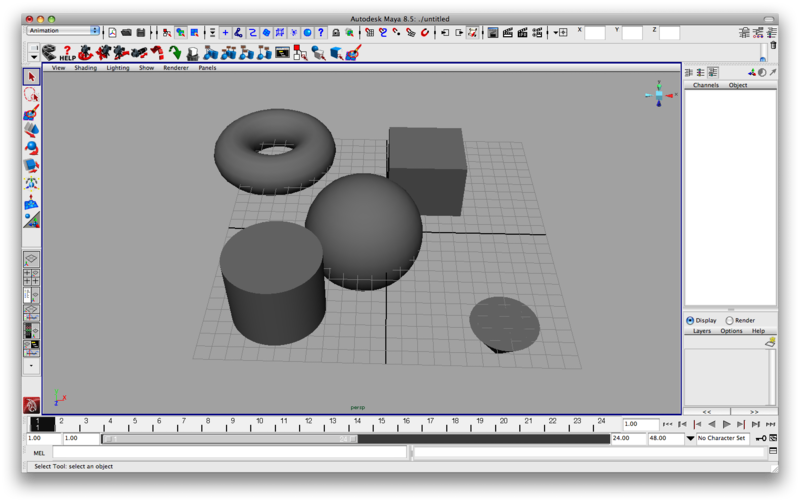 Right now I am on spring break and only have access to a powerpc machine so I cannot get to Rhino, but next week I should be able to make you some primitive shapes. 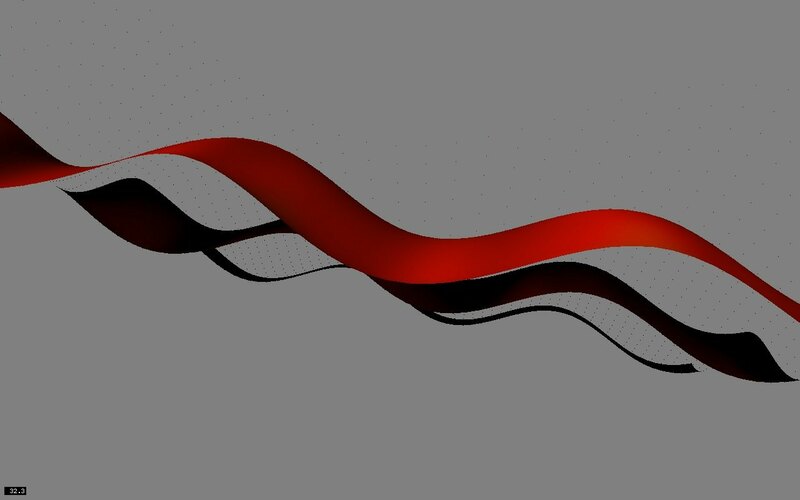 Let me know what you want, the possibilities with NURBS are endless so I can try a bunch. I may be able to get you some .fbx files as well. Edit: I just made a sample file of some primitives in .fbx format out of Maya. There are tons of options during export so if this version does not work for you I can try an earlier version of the format or different interpolation or any of the other options. I changed the extension to .txt to get around the attachment restrictions, just change it back to .fbx. I don't plan on using nurbs directly, but I think it would be nice to tesselate them so they could be used. Having the formula to make them also allows for some Level-of-Detail mesh decimation. It's quite possible to make good meshes from nurbs surfaces, you just need to be a bit careful. If the experiments fail to produce decent results, it'll be postponed or abandoned. Most 3d programs that handle NURBS allow you to convert the object to a mesh with fairly detailed controls. Is there an advantage to having this same functionality in QC? possibly 2 reasons I can think of. Second: You don't have any tools. I — this may come as a surprise — have no 3d tools on my machine. None. No 3D Studio, no rhino, no maya, no cad programs, no wings3d, no milkshape, no blender, nothing. I'm not an artist, so these tools, while really cool, provide very little value to me personally. If a model happens to be provided (like your sample one above) in NURBs only format, it's totally useless to me if kineme3d can't handle meshing it itself if it needs to. Glad to help, I'll get the .3dm to you sometime next week. Is that what the model looked like when you imported it, or did you play with it once it was in? I did not add colors and they were not arranged in a line like that. Also the cylinder and cube seem to be split into pieces which I did not do. I spread them out on a line to see each piece. I also added the color (I don't load colors from models). they're not transformed properly yet; I've got some kinks to work out with that still, which is why the cap and base of the cube, the base of the cone, and all the sides of the cube are split up. I've never seen a 3d tool split geometry like that before -- possibly necessary because of how nurbs works or something. The one big advantage of nurbs i can think of straight off is that you effectively have a low-res mesh that generates a high-res one for output. If you can tessellate per frame, it's brilliant for doing nasty transformations with the mesh as you just animate a few hundred points instead of thousands, then tessellate. Right now, I tesselate when the object is loaded. There's no convention for passing around/animating nurbs meshes in kineme 3d. While you'd save a bunch of time in mesh transformation (as you stated), you'll pick up those costs in tessellation (evaluating the surface + calculating normals), so I don't know that there'll be any gain. I think it's probably great for certain cases - particularly where you're transforming a mesh in a way that takes much more cpu time than tessellation would. I seem to remember it being extremely good for IK animation. I've been thinking about 3D stuff in Quartz lately, and one obvious patch would be an importer of sorts from various formats. There was even some recent discussion on the qc mailinglist about this functionality. I'm not sure how much more developed it is in QCLeopard, but I think that instead of just a simple mesh importer, we might also want to make some kind of keyframe or skeletal animation patch for these 3d models. Keyframing can be a hack using the object buffer (not yet released), but skeletal animation will require some more working. Unfortunately, my knowledge of how people actually use and manipulate geometry for real projects is quite limited. Any thoughts or ideas on how we can develop 3D functionality in QC? smokris, is the 3D system more developed in QCLeopard? have you got an idea of how to approach this yet? Check out the GL Tools... look at the Field of View, the Orthogonal perspective, GL Viewport, GL Matrix Mult, GL Load Matrix... and maybe even the built in Apple field of view though I don't particularly use that. Using these with or without various blurs can make it look as though there is a "camera". ...If you mean deriving 3D structure from camera data, like turning a camera shot into a 3D object, I don't think so yet (though I swear I think this can be done... in my dreams, lol). Could you upload some more screenshots of the Pixelshox object loader (there is an Inspector view, I assume?) and the downstream transformations you can perform with it? How about an inverse-kinematics engine? For animated models, FBX file format seems the way to go, as it is a native format from most mainstream packages (MAX, Maya, MoBuilder....). I guess that even Endorphin can save FBX. An IK engine is REALLY interesting, however, it might be a huge project though.... with the need of, .... , a timeline maybe, or a system to trigger "actions" sequentially ( at which QC is really BAD actually). Why not start with something simpler, like Morph targets ? Yes, FBX looks really good so far (I hadn't heard of it until now). And Autodesk provides a free converter to handle 3ds/obj/collada/dxf, so we might even get away with only supporting FBX, since it seems to be a superset of all of those formats. I was wondering if this request was still under the hood. 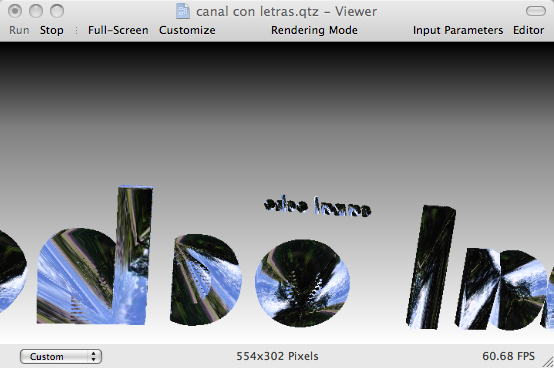 So far, Leopard didn't provide any interesting NEW patch (apart from the GLSL grid patch) to deal with 3D. As QC DOes have a GLSL shader patch to do all sort of manipulations, i'm still very interested in having a custom 3D object loader of any kind of format (i can deal with that ...) Mesh blending via vertexbuffer is an OVERKILL bonus. I agree. It would be great to have a simple object loader. Supporting lots of formats and animation would be cool, but let's start with something simple. The 3DS loader original code is from www.spacesimulator.net and there is a lot of interesting things about 3DS file structure. and what's an open gl patch coder ? Just a quick question. If, hypothetically, we were to load an OBJ (or any format, really) without normals, should the loader fill them in automatically, calculated from the faces? Lighting doesn't work without them, and shaders may not work as well either. If we fill them in (fairly simple, just a bit of math), should we also provide an option to smooth normals (i.e. merge normals shared at the same point) ? this is a bit trickier, but could provide for some nicer looking objects without a lot of extra effort somewhere else. If no normal info is present, then i think the loader should compute them automatically, although usually normals are present in the export file. Aren't they within an OBJ ? Some of the sample obj's I've got have no normal information. Smoothing can get pretty complex: you can merge normals at a vertex if they're within a certain Degree range to allow sharp corners and smooth parts as well. I don't Think I'll go that far just yet, but simple "average all the normals at this vertex" stuff is simple. I love this one ! 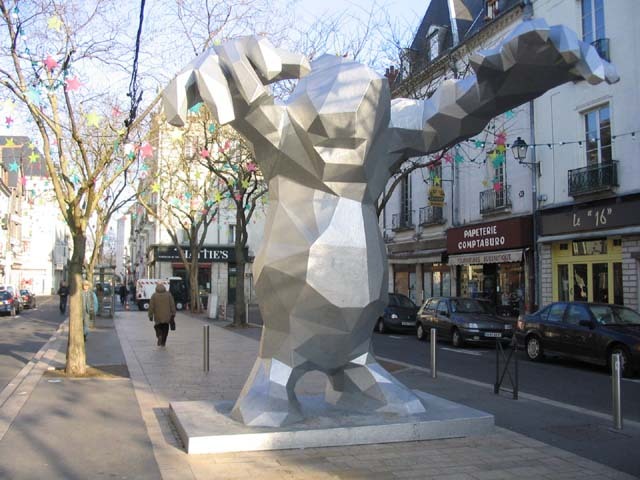 Veilhan monster in "Tours " france. That's pretty slick :) umm... probably not in the first version :) It looks really useful though, so it's definitely something to keep in mind. In the true spirit of our patches, if it's an option, there'll be an input to turn it off or configure it. We'd never force smooth normals (I argued your exact argument when forced smoothing came up earlier), it's just an option that might be desired. Ok, I've been grinding on some kineme3d stuff quite a bit lately, and I've finally managed to get fast smooth normals to work correctly, and not crash (it was more difficult than I expected to satisfy both of those criteria). Is that a pre-made mesh, or dynamically-generated? That's a dynamically generated plane (64x64 squares) passed through the ripple deformer driven by sound input. It's inside a Polygon Mode patch, so back faces are rendered as dots (I liked the wavy strip look). textured with the flame patch. Model and Texture provided by @franz. 3ds model, 9216 faces. 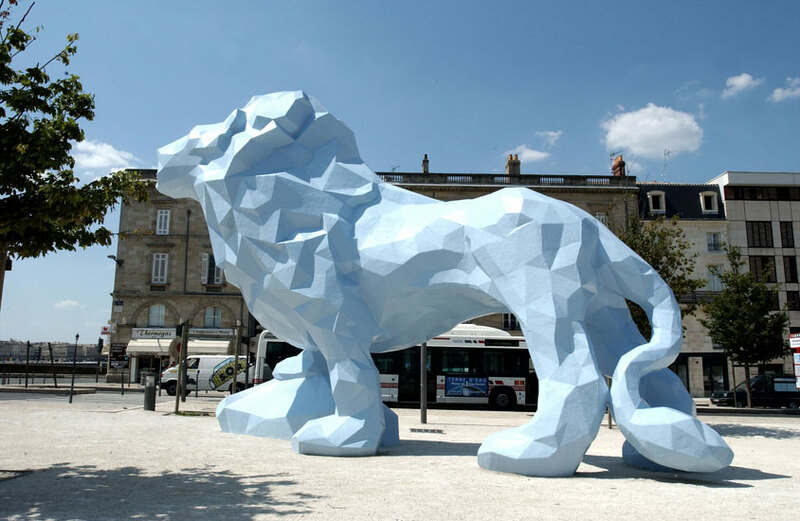 non-smooth normals. I can't wait to play with you ....:) what format ? howdy! I might even pay for a beta...maybe a little help installing it/compiling it if necessary. -vance feldman you know how to find me. With Alpha 9 nearing completion, I've decided to lighten up the restrictions on what can be discussed with Kineme 3D. Anyway, back to learning GLSL, and figuring out the normals. Just wondering: Is there a trick to ensure that when you 'pixellate' a 3D object, as in the spoiler (very impressive, incidentally), you get only right-angle cube forms, and no diagonally-angled faces? I'm messing around with quantizing vertex positions in GLSL, but I get lots of non-cube shapes. Quite nice and glitchy, but would be nice to get a smother effect also. Does the 3D pixellate effect only work because you have access to all the meshes vertices in OpenGL? I'm not sure about how one would accomplish this in GLSL, but it's a problem in Kineme 3D's quantizer too at the moment. I've not thought about it too much, but I'm sure there's some way to get it to play nicely. Translation and Rotation in QC may be underdeveloped: You can't apply multiple transformations sequentially (i.e. translate -5 x, rotate 32° on y axis, rotate 12° on z axis, translate +6 z, translate +5 x...) without a bunch of nested 3D Transformation patches. Maybe I'm mistaken and this can all be done with one rotation/translation step though — please let me know if I am. If not, I think an interesting new idea might be "Transformation Lists", where you list (connect transformation patches) transformations to pass to the renderer. Then, the renderer will apply them all in order before rendering. This would have the benefit of being fast (implemented automatically in OpenGL) and feature-complete. This seems less clunky than putting stuff in multiple nested 3D Transformation patches. There could even be a "3D Transformation List" macro patch that acts like the current 3D Transformation patch, but handles them all at once. So I stumbled on this video of some Apple dev conference last year, they have demostrated the Leopard QC custom patch feature by integrating Ogre into QC! Unfortunately it doesnt seem like they ever released that code as a sample. If anybody can implement something similar then Im up for donating $500 or so, as I could really use this sort of functionality. Well I suppose its not the official Apple sentiment, which I guess would be to pretend the pre-Leopard SDK never existed. Im not sure if its possible to look on the bright side and say its better to be called skanky than airbrushed out of history or called useless like the omni product he pisstook at the end. 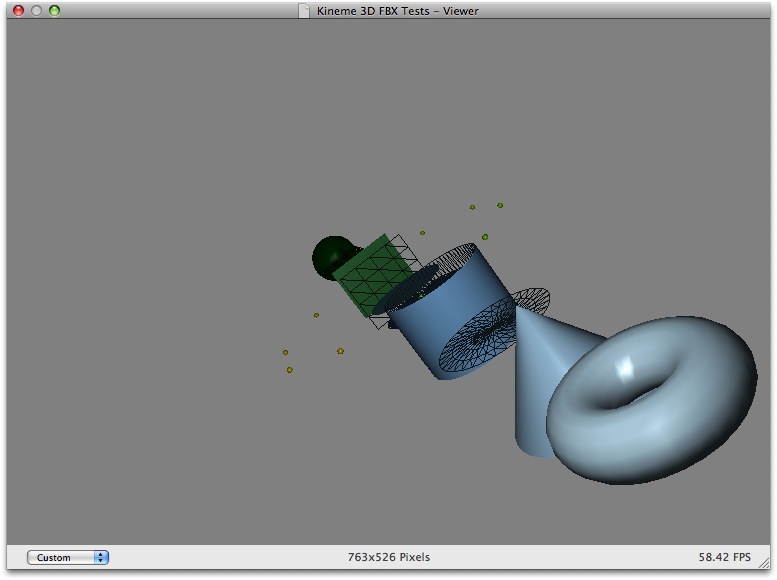 We've been looking at Ogre3D, actually, for possible wrapping into QC. We were kinda thrown back by the hugeness of Ogre3D and were looking for something a bit leaner.. and our current 3d-object-loader alphas do most of what the demo showed. Well I dont mind at all what you use to achieve it, its just that video got me drooling with the possibilities, especially animation. But anything would be a nice start, is there any way to buy myself access to the alpha version? I should learn to be patient and make a nice donation, I know, but I couldnt help asking. 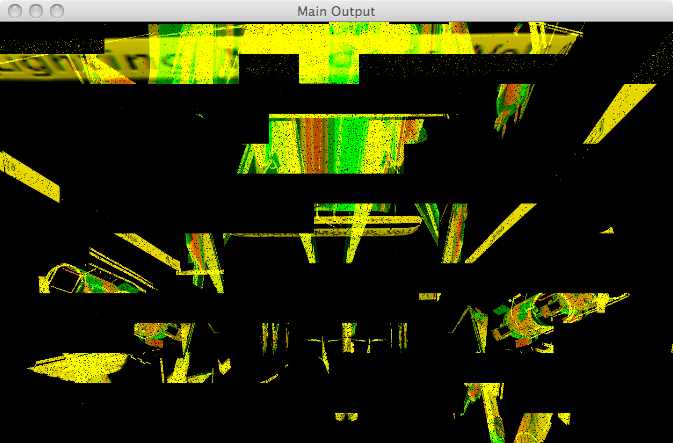 I am friends with the programmer who ported Ogre3D to Jitter, an alternative patching environment similar to Quartz. The keyframe animation and blending is really incredibly useful, and should be valued. ... I have plans to do some 3d with QC too, but I'm planning on using realtime generated objects rather than loading up a model. The idea is to have an algorithm that generates and modifies object meshes on the fly, with the results being animated (basically, objects 'grow' in 3d, imagine plants growing and you'll have a rough idea). It'd probably be better to do this without QC, but then it has almost everything else I need for the project, and it's an idea environment for experimenting. A main code loop outside QC, that creates, modifies + destroys the objects. Each object is reflected in a macro patch in QC. 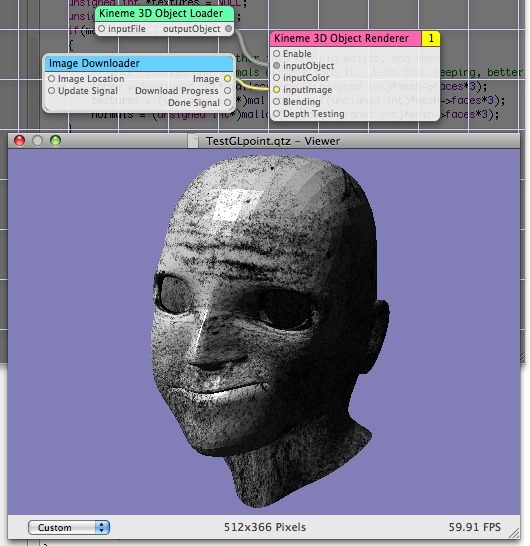 The object macro contains patches for the mesh, lighting, texturing and rendering controls. 'Animator' patches that modify the mesh (perhaps with a 'tweening' patch, so that the animator patch calculates the new vertex positions, and the tween patch animates it). Modifier patches to give some control over appearance - one thing I want to do is to be able to 'age' the objects, by changing the base colour and possibly texture and mesh over time. Some wind simulation on the meshes would be good too. So, seeing as you guys have a lot more experience with QC than I have (I've learnt the ropes, and done a few quick tests, and that's about all), how practical does that look, and what kind of problems am I likely to hit? Performance of the overall system should be fine, as I already have it so that the amount of stuff being drawn and the amount of stuff happening scales to fit the processing power available. Also, how easy is it to link an external program in to QC so that patches can be inserted and connected by the program? How about sound too, would it be reasonable (or wise) to add sound in (I plan to add sort-of sound effects, so when something gets triggered a sound plays (midi would probably do)). Last thing... how necessary is it to use obj-c? My code at present is in python (this started as a terrible abuse of the procedural modelling system in houdini. :) It wouldn't be much work to rewrite it in obj-c, but brushing up my obj-c in the first place would take some time. It's difficult to have a generic dynamic object (most dynamic algorithms I've seen for object creation are very specialized; they make plants, or trees, or water, or whatever, but there's a lot of customization for each one, so there's not much of a consistent interface for these...) perhaps we could make a generic "plugin-registration" patch that allows users to create their own object creation code, and have it get loaded into QC via this patch (kind of like a plugin, but in a plugin itself...). Linking external programs to QC isn't difficult. If you embed QC in your app, you can use the provided published inputs and outputs. If you're wanting to control QC from a separate program, it's a bit more difficult, bu I've heard of a few different methods. I've got some sound stuff in the works (don't expect anything soon though... what I want to do is process audio via nodes similar to how graphics are processed in QC. This is a pretty complex procedure, and Apple's Audio documentation is ... shall we say, lacking?). Triggering sound is really simple though; I'd be surprised if someone hasn't already made a plugin to do that. I've a good idea of how the dynamic objects will work already (actually I've had a rough test version running via python and houdini), and what I plan should actually be quite well suited for use as a patch. As a rough idea, you have say a 'plant' patch. Initialising it would cause just a small shoot mesh to be created. You'd then have an input called 'grow', triggering it would cause a branch, or a sub-branch, or a flower to be added (depending on the current state of the plant, and with a bit of randomness thrown in). The output would be the mesh, which would either be modified over time to animate the growth, or just passed whole to an animator patch that would morph from the old mesh to the new one. (I prefer the second option, as I think it will be easier to deal with cases where a new growth trigger comes before the last one has finished growing. The plant patch just generates a new mesh with the extra branch or whatever, and the animator patch just has to morph between it's current state and the new state). For an idea of how the animation might work (unfortunately windows only, but there's a video), check out some of the growing lines on this: http://www.pouet.net/prod.php?which=31571. I'd use similar methods, but with a totally different look. I've had a quick look at the pyobjc bridge, and it looks workable (from what I've read, you write pure python with the exception of the methods as you said. I'll see how it goes with that initially - it'll be easier, but I guess a lot slower and with more hacks, so I might end up switching to objc. As to sharing the code.. it depends on how it all works. I think the main bits I'll be doing won't be of much interest to anyone as it'll be very much fixed purpose (unless it'd be good as a tutorial, which I REALLY doubt if it contains any of my code :). The audio, mesh animation + texture/lighting stuff might be more useful, and I'll make those public if they can work with everyone else's stuff. Any physics/collision detection stuff will unfortunately be a really cheap + nasty hack if it gets done at all, so beyond basic gravity perhaps wind I doubt anything will be done as a patch. I'll have to see anyway, I'm busy with a lot of other stuff so I expect this to take a long, long time! I'll let you know how it goes as I go along. There's a huge amount of stuff like that in the demoscene (if you're not aware of it, people make 'demos' - programs that do some fancy graphics with sound, in realtime, much like what we're doing with QC but people tend to make their own tools). There's plenty of good stuff here: http://www.pouet.net/top10.php Most of it is windows only unfortunately, there are only a few for OSX (and a lot of those are ports of windows demos) but if you have windows installed there's plenty of inspiration. Werkkzeug is one of a very few demo tools that are public - unfortunately most of them are kept private, as the groups compete hard with eachother. Even with werkkzeug, the version I linked to is v1 - they're currently producing stuff with v3! Take a look at kkreiger for an idea of what they can do with the later version - it's a FPS game (windows only again), with a big map, weapons, enemies, and very detailed graphics. It's 96kb in total, including everything. It all gets generated procedurally when it loads, and they've got their own synthesisers for the music + sound. Actually I think some of the other groups are doing more interesting demos, check out recent demos by ASD or fairlight (the city in the fairlight demo is procedurally generated - that kind of thing is well suited to QC!). And if you hadn't noticed - it's a demo I'm working on. I wanted to do something on OSX, and QC pretty much is a demo tool (and kudos to Apple for being the first company to provide a demo tool with their OS!) It makes sense to use QC as a base, and build my own stuff around it. My ideal would be an environment to write music/visual compositions... where I can organically write both at the same time. There is stuff out there, but I would really just like to be able to do what you are describing within Quartz Composer. On the dynamic object front, I use vvvv, and dynamic objects can be made in 2 ways, 1 the is an object loader node, that can be attached to a mesh split node, which outputs a vertex buffer and an indices, you can then attach a vertex buffer node that spits out an array of vertices, normals and texture coordinates. You can then use math nodes etc to manipulate the vertices, and then put them all back together via a vertex buffer join node and mesh join, at the end of which its juts a model again. This is obviously cpu intensive! The second way is to use vertex shaders to deform a gird object of the resolution that you require, this is far faster, I'm planning on trying this second method with glsl bu tsimply havent had time, I'll keep you all inform though! I've already got the loader/cpu-bound deformation stuff under control (as in I understand it, not that I've implemented much ). However, I'm very interested to know how vvvv handles the shader method you mentioned. Does it abstract shaders somehow, so you can have multiple vertex shaders applied to one mesh, or is there one self-contained vertex shader only? If it's the latter, I guess I'm not that interested in it (that's what glsl can do out of the box, more or less), but the former might have some interesting design decisions that could be useful. I've done some (unsuccessful) experiments with the glOrtho function in GLTools to try to accomplish this, but I've not had any success yet. It might be possible with the Matrix patch if you're not afraid to get your hands dirty with Matrix Math. The Projection Matrix may still break this though (the matrix patch modifies the model view matrix only). I'm also interested in that function (this is my architect part...), but i don't think you can achieve ortho projection with Kineme Matrix patch. I've been buzzing a lot with Matrix patch recently, and didn't manage to get the desired effect. yeah! Just discover this place. Guys you rock! i've been waiting since ages that some guys will developp a 3d object feature into QC. Thanks a lot guys! This is so great, just came across this project as well. Thanks to all the exciting work. I'm glad you two have stumbled in and decided to participate :) Just curious, how'd you find your way here? Just diggin the web for some crazy guys who devellop crazy project to support them! Yes! this would be so sweet! physx (nvidia's physics engine) is freely available to Windows and Linux users, but not osx without a $50,000 license fee. is it time to break out an opensource physics engine, or are those vastly inferior to the above? other thoughts? Is it a remix of a track by The Knife, by any chance? ah.. thought so. There's a tiny snippet of the tracks original melody in there I picked up on. I'm quite a fan of The Knife. I only heard of them because they were the subject of much critical bandwagoning here in the UK about a year ago. The whole music journo circus has moved on now, of course (to anything that could be labelled 'dubstep', or maybe that was last month- I lose track). Would it be possible to have the object-loader optionally calculate Binormal and Tangent vectors for the imported geometry, and pass those to an enclosing GLSL Shader patch as vertex attributes? I ask because it makes GLSL tangent-space bumpmapping easier (possible?). binormal = tangent × Normal, so that's "not our problem" in this case ;) (provided you have the tangent vector, you can do the multiply yourself). Good point with less work in VS-land -- I typically run into vertex attribute limits before running into VS complexity limits, so I default to calculate as much in the shader as possible if it lightens the attribute load. If there's no pressing limit though, you're totally right, and passing it along would speed up rendering a bit. im lost, i tried in many ways to import s simple text obj model, and theres no holes in the letters, they have a cap covering all, i tried exporting from modo, an maya with no success. well ive tried in other ways with the text model till i decided to just delete the front faces from my mesh, justo to match the movement, everything was fine and then i get this weird error, on the qtz i was working on, now i cant even move the model. 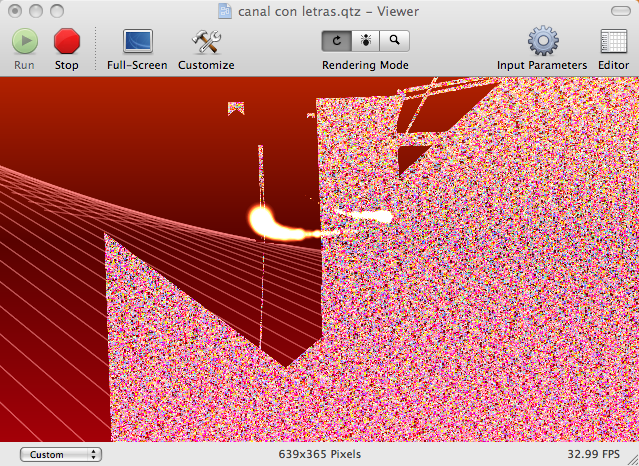 in qc, it looks good, but in vdmx, i get this, using GL Model Importer (on a geforce 8600m gt). any suggestions? are you releasing another patch soon? I noticed it looked like you were using the "image map" glsl example.... this is a "spoiler" clip of Alpha9 with the image map glsl and some fairy dust. Quartz Crystal render. The upload to vimeo does do something a little odd to the red in the background at times... the re-compression I guess. And it looks better in HD over at Vimeo... oh well. Is testing closed? :) I'd like to test too. Testing is closed for now. what's your reflexion shader ? It doesn't seem to take the video into account ... or does it ? On the very first one, I wasn't using the railroad as part of the image map... it would be better if I had done that. On the one with the sobel effect, and subsequently, I used the railroad as part of the image map. If I get a second, I will go back and use the railroad as the image map and post a quick clip of the difference. It was probably a wobble filter or the stock image map example from the developer qtz's. This is blatantly derived from an example composition of Chris's. I wrapped it in a "wobble GLSL" shader, did a few minor tweaks, and replaced his "sphere" with the infamous teapot.